The devotion to the angels lead us to God. By adoring God we please the angels and we please the angels when we pray. The angels are pure spirits and created by God. Devotion to the angels leads us to God. Angels who are pure spirits fight for us constantly. A person who is dying, even if he or she is far away from God, the angels fight for them right up until the end. Our guardian angel does not want us to commit sin and can lead us to the confessional. It’s a very personal relationship with our guardian angel. They need to familiarise and acquire knowledge about us as a person. If a mother or father has a child for example, it takes a while to get to know them and it is the same with the angels, they know our weakest points and our strongest points. When we are weak the fallen angels have an opportunity to tempt us. We should be aware that we have a guardian angel and each of them is different and individual. My guardian angel would be different to yours, it is true to say they are as close to us as a twin brother or sister would be, it is a very close personal relationship. As their name suggests guardian angels are our real guardians, messengers from a loving God, fostering our desires, wanting to lead us to heaven, to the Father’s home. The angels minister to us all the time, inspiring us to pray and protecting us, but we may not always be aware of this. We ask Jesus and St Michael the Archangel to help us and give us strength to be holy and good in all that we do. May our guardian angel help us to have a good conscience and always do the right thing. Jesus Christ is ready once again to be crucified and to die for you and me. You can always turn to Him. He will give you a wonderful welcome because you are his beloved. Your place is in His heart. Only this can make you fully and endlessly happy. I assure you of the constant daily prayers of the priests of the Congregation of St Michael the Archangel for all our readers and their families. 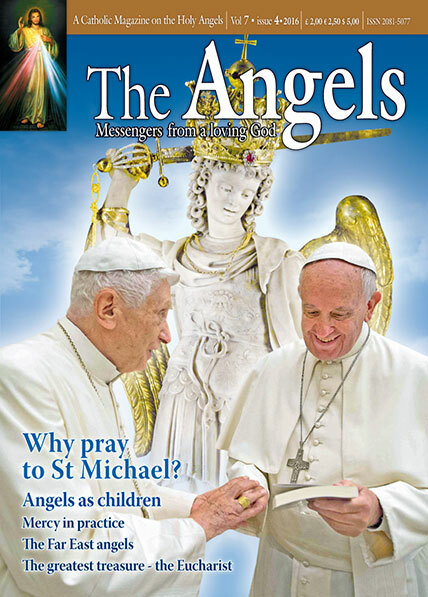 Please let others know about this magazine and help us to distribute it all over the world and view our new website www.stmichaelthearchangel.info.